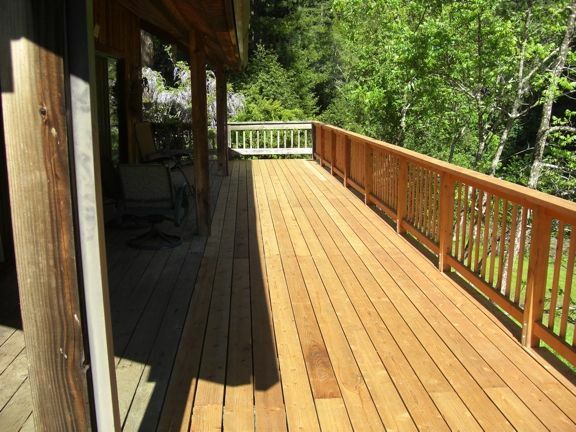 A redwood deck is a building addition that often surrounds living spaces. Built with lumber from the western conifer, Sequoia sempervirens, a redwood deck commonly has a pier and post foundation underlaying two inch by six inch by one inch wide and a half inch thick boards. The modern method of fastening boards to foundation is with three and one half inch deck screws. Railings for the decking are usually three feet high with vertical slats four inches apart. A coating of protective finish, such as SuperDeck, helps preserve the integrity of the construction.